This was my very first post written in June of 2011. It has been updated to provide even more relevant information for other expectant mothers in Pennsylvania–especially Allegheny County. Hey, everyone! Thanks for checking out my first post! I wanted to start writing about something that was relevant. That was helpful. So I decided to start writing about something that has become an ever-present obsession in my life lately: saving money. That includes saving money doing awesome things like going to museums, shows, festivals, skiing, vacationing and shopping. It also includes figuring out how to pay for the everyday necessities. Like groceries, books for school and bringing a child into the world. I found out some months ago that I was pregnant. I had this picture in my head that the only reaction I’d ever have when the positive lines came up on the stick would be uncontainable excitement. But when I saw the surprising confirmation on that thing I had just drenched with my own urine (the first of many disgusting realities of pregnancy,) the only thing I felt was fear. I was with a great guy. Still am. Who supports me 100%. Who couldn’t be more excited about having a child. I am extremely lucky. But I was paying a lot of money for really poor health insurance just for myself and struggling to pay bills each month while working 40 hours a week at a job that already took a lot out of me. I had no idea how I was going to get through my pregnancy with all the prenatal appointments, hospital costs, baby gear, and then take care of the baby after all was said and done. I didn’t want to go on welfare. I’ve always had this social stigma against it. I confused any use of the system as all out abuse. But you know what I learned after I saw those pink lines come up? A child was coming into this world, and it was my responsibility to take care of them the best way I could. I couldn’t allow my unjustified guilt and pride to get in the way of a program that could help me take the best care of my child as I could. So I applied for state-sponsored health insurance—AKA Medicaid. In Western Pennsylvania, it was confusing. No one wanted to or could help me figure it out, even if helping me do so was in their job description. After tons of phone calls and hours of sifting through paperwork, I figured a lot of it out. And now comes the practical part of my blog entry: sharing what I’ve learned about Medicaid for pregnant women in Pennsylvania–specifically Allegheny County. The first step is just applying. You can do it online or at your welfare office. PA’s COMPASS website has links where you can find out if you qualify and apply. If you’re confused about whether you qualify or not, just apply. It can’t hurt. Shortly after, you will receive a letter and/or phone call from the welfare office requesting documents proving your identity (two forms of I.D. unless you have something like a passport,) pregnancy confirmation paperwork (which you can obtain from a doctor–they will back bill Medicaid for this,) pay stubs for the past month, rent/mortgage paperwork, and possibly current utility bills. If you’re applying in person, I would highly recommend bringing all this paperwork with you when you go down to apply. Then you either get approved or disapproved. If you’re approved, they send you all this information that really tells you very little. They tell you to pick which plan you want. In Allegheny county, your options are currently Gateway or UPMC. Note: Effective in June of 2017, Aetna and United Healthcare will no longer be offered as Medicaid options in Pennsylvania. Because of this, they are not included in this post –that’s six months away and growing a baby takes nine. In my personal experience, I have had more covered with less headaches with Gateway than with UPMC. BEFORE YOU PICK YOUR PLAN, MAKE SURE YOUR OB ACCEPTS IT! Not just your OB, but whichever hospital they use to deliver babies. You should be provided with a list that tells you which of these plans are accepted at which hospitals in your county. If that doesn’t happen, just ask your doctor’s office. Step 3: USE YOUR PLAN! 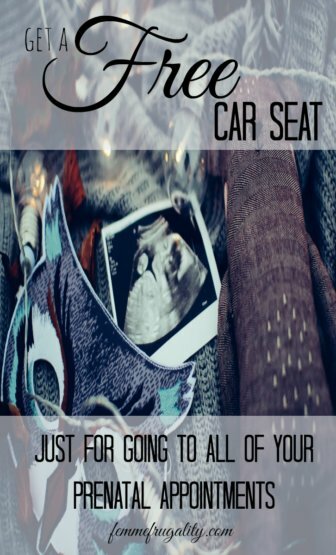 Get a free car seat! I’m all about utilizing every aspect of my plan. My prescriptions had very low co pays. Like $1 low. On top of that, both of these insurers offer a rewards program for pregnant women. Make sure you are signed up for this! All you have to do is go to all of your prenatal appointments (which you’re doing anyways) and then they give you your choice of a baby product. It may be a free car seat, a free stroller or a free pack’n’play. I want to note that when I got a free car seat, it did not arrive until after my baby was born. It was perfect for when they grew out of their baby carrier, though. Gateway’s rewards program is called MOM Matters. You need to go to your first prenatal appointment by the 14th week of pregnancy, go to all of the rest of your prenatal appointments, get your attendance certified by your doctor, and then mail the signed paperwork in after the 36th week of pregnancy. In order to qualify for UPMC’s New Beginning program, you need to go to your first prenatal appointment by the 13th week of pregnancy, go to at least 10 prenatal appointments, get all the routine labs your doctor requests, keep phone appointment with UPMC’s maternity staff and sign up by the 34th week of pregnancy. You’ll also have to get all the paperwork signed and mailed. Once you get your free car seat, make sure you have a professional look it over to make sure it’s installed correctly. In addition, your insurer should provide you with a breast pump if you are breastfeeding. They either have forms at your OB’s office, or, if they don’t, you can call your insurer and request that they get one to you or the doctor. You and the baby will be covered until six weeks after the birth. Your child will likely qualify for their own Medicaid policy or CHIP at that time. If you no longer qualify for Medicaid, having a child is a qualified life event for a special enrollment period on the marketplace. Having a child will up your subsidy, which means you may now be able to afford insurance for yourself. This entry was posted in Family Finance, Ways to Save Money on June 28, 2011 by femmefrugality. I’d love to know what kind of car seat they giver, etc. Can you or any readers, perhaps share photos of the gifts? My daughter isn’t sure which to choose. A few years ago we got a Cosco convertible through our insurer’s program. It really depends on who your insurer is as to which model they offer and if they even have a program at all. I’m sure the model has been updated since ours, so I’d call up your insurer and see. Gateway was a really great choice for our family at the time if you haven’t chosen which provider you’ll use. Think they still are, but I’d be super thorough now since the Highmark UPMC debacle that’s come to a head effective Jan 2015. When we used it, it was a car seat, a pack n play or a stroller. I would call your insurer not only to find out what the rewards are, but also to get your hands on the paperwork you need that will allow you to get them. Hi , I’m enrolled in the program and the gifts are the same the stroller, car seat, pack and play. I don’t know the brands but your doctor will need to sign off at 28 weeks. Hope this helps.